Castle Leslie Estate in County Monaghan is nestled on 1,000 acres of undulating Irish countryside, dotted with ancient woodland and glittering lakes. It is one of the last great Irish Castle estates still in the hands of its founding family. Since the 1660s the distinguished and somewhat individual Leslie family have lived on the Estate. They have welcomed everyone from politicians to poets, ambassadors to ufologists to world renowned celebrities. 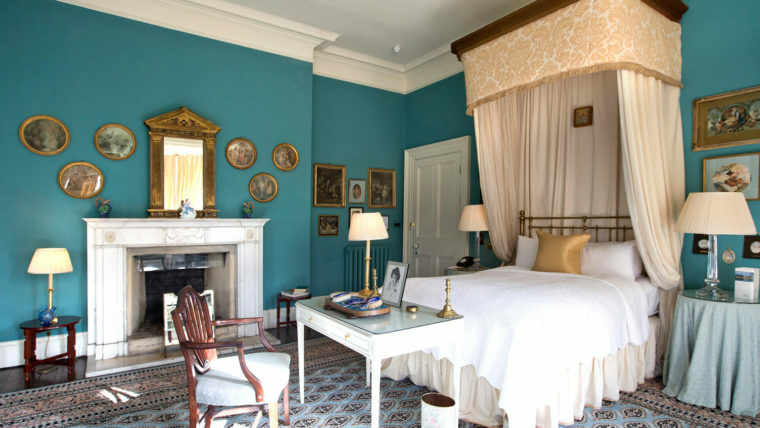 Castle Leslie Estate is now truly one of the finest luxury estates in Ireland. Following significant investment and a major restoration programme over the last two decades, it is waiting to be discovered by you. Castle Leslie Estate is just 80 minutes from Dublin and 60 minutes from Belfast, yet a millions miles from anywhere! We invite you to experience some of the most unique and enchanting accommodation Ireland has on offer. 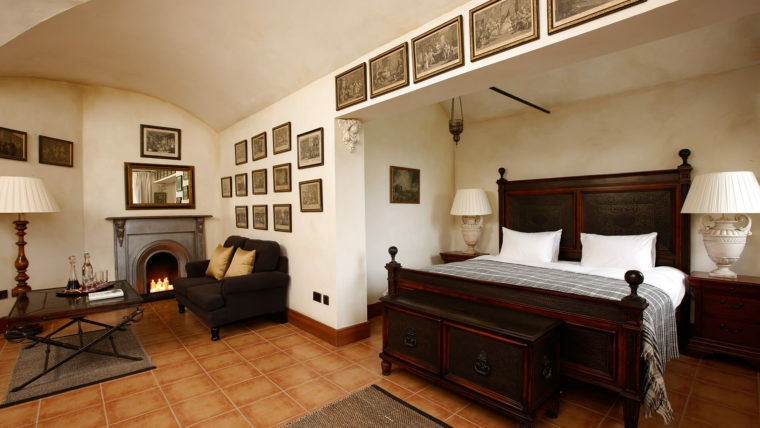 The Castle, at the heart of the Estate, offers authentic original interiors and old-style hospitality and is a complete respite from the world. The Lodge is the social hub of the Estate and brings locals and guests together in an atmosphere of conviviality and comfort. The Old Stable Mews and Village Cottages offers guests convenience, as well as the privacy of luxury home rental. The Estate offers an idyllic setting for outdoor activity and adventure. It’s the perfect place to discover the thrill of exploring the countryside on horseback or foot. You can spend a few hours fishing on one of Ireland’s best-preserved lakes. 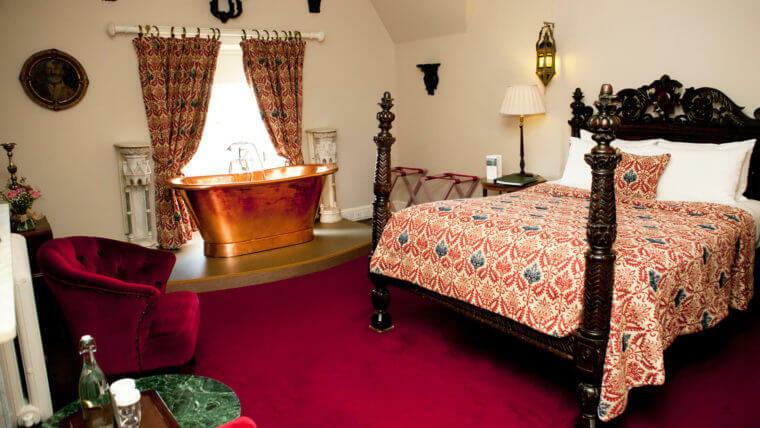 Alternatively, you might prefer to enjoy a massage in the Victorian Treatment Rooms at the end of an activity packed day or relax with a book in one of our many beautiful rooms in the Castle or the Lodge. A truly private and stunningly beautiful location, Castle Leslie Estate is also a magical setting for unique weddings! All these factors help make us one of the most renowned country estates Ireland has to offer. Come take a look at the wonders of Castle Leslie surrounded by acres of picturesque & untouched countryside. At Castle Leslie Estate, it’s all about choice. No matter where you dine on the Estate, you will enjoy the best of classic Irish cooking. Castle Leslie Estate is the perfect, breathtaking venue for your wedding celebration. Nestled on 1,000 acres of undulating Irish countryside, dotted with ancient woodlands and glittering lakes. 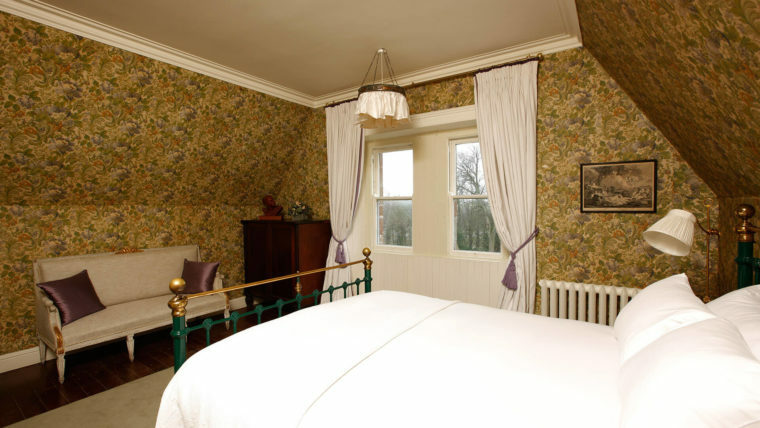 A visit to the Victorian Treatment Rooms will leave you feeling refreshed and revitalised. We have seven treatment rooms, a relaxation area and an outdoor hot tub. As one of Europe’s finest equestrian playgrounds, Castle Leslie Estate offers memorable horse riding holiday experiences for riding enthusiasts of all levels. Castle Leslie Estate offers a wide variety of activities, both on and off the Estate, to satisfy guests’ every desire. Our wedding all went perfectly and better than we could ever have thought. It was great from start to stop and honestly couldn't have went any better! You were great from start to finish, the guys in reservations couldn't have helped anymore and John on the day was an absolute gent and made sure everything ran perfectly, along with all the rest for the staff. We couldn't be any happier with how the day turned out and every single guest was amazed at the place and complimentary on everything from the venue, to the food, the bedrooms, decor and the staff. It truly was perfection all round so thank you and all the guys again.We can't wait to get booked in again and will definitely be back next year. I would urge anyone who hasn’t visited yet to stay. Simply beautiful setting, very welcoming staff with a personal service and delicious food at Snappers restaurant. No wonder it has won many awards. The Castle itself really does take you back to what it would have been like to live here in days gone by and with the lake on its doorstep you can simply sit back and immerse yourself in the magical experience and wonderful views. Our wedding day was like a dream come true. We are so proud of our day and the feedback from our guests has been nothing but positive. My vegan guests commented that they have never had such a fabulous meal at a wedding- the food was outstanding for them. We were blessed with the weather too for photos and John was a great help during this. It's the most beautiful location. Helen, we are over the moon about our day, the venue was beautiful and I would highly recommend Castle Leslie Estate as a venue to anyone. My parents feel exactly the same. Thank YOU so much. You were an absolute joy to work with and made us feel valued and important. Can we please do it all again?? Excellent experience everyone was so welcoming to us from the moment we walked into the Castle, we met a very helpful manager who gave us a guided tour of the castle, and all the staff couldn’t have been friendlier to us! We then went for a drink in the lodge and got the same welcome and had the same excellent experience there also, Top class place to visit I can’t recommend it highly enough! My first impression of the Castle was its just amazing. Once you step inside the doors of the Castle you every need is catered for. 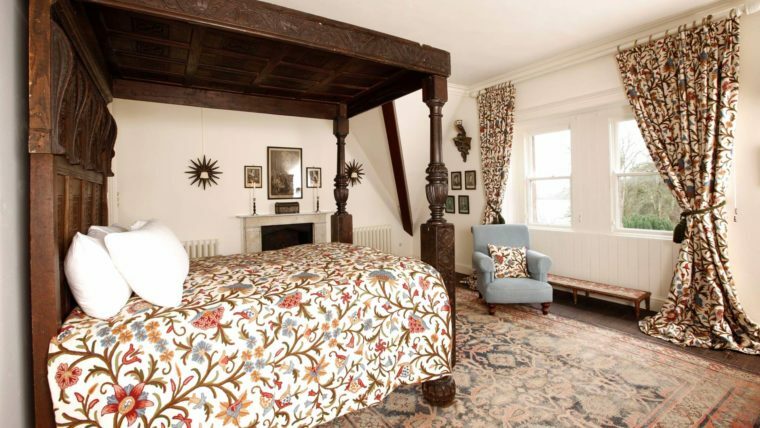 The rooms are just stunning. The staff cannot do enough for you. We went horse riding and the experience was everything I could have hoped for and grounds were so peaceful and excellent views. It was our first time at the Castle but won’t be our last. We were given the break away for a wedding present and it was the best present we received! Fabulous hotel, fabulous setting and great staff. Stayed at the Lodge in a beautiful room with balcony overlooking the stables. Breakfast was great as was food in the bar. Had afternoon tea at the castle which was lovely too and the waitress was a very friendly lady. Such a relaxing place. The Castle is just the nicest setting with the gardens, lake and boathouse and we just seen it in the snow. Would love to see it with the sun shining. Highly recommend!